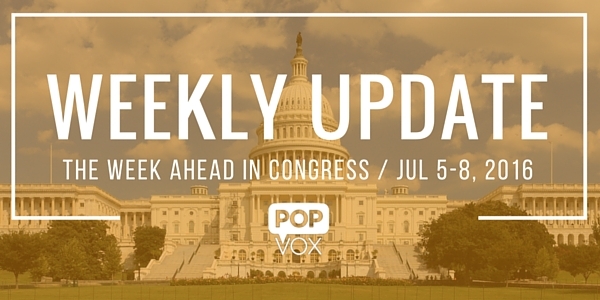 Congress returns from July 4 to begin its annual sprint to August recess. The House will take up a counterterrorism bill that includes restrictions on gun purchases for terror suspects, as well as bills on mental health, Medicare payment policies for medical equipment, and fixes to new crowdfunding rules. It may also vote on the FAA and Defense authorization bills if they are ready, and the conference report for the combined House/Senate opioid bill. The Senate will vote on tightening immigration enforcement for those convicted of crimes and penalizing "sanctuary cities" before turning to a bill to provide a federal standard for state GMO labeling requirements. Last week, House GOP leaders announced a bill that includes the ability for law enforcement to seek to block firearms purchases if they suspect the person poses a terrorism risk. When the Attorney General is notified of a request to transfer a firearm or an explosive to a person who is being, or has been investigated during the previous 5 years, as a known or suspected terrorist, the Attorney General shall notify relevant Federal, state, or local law enforcement agencies, or intelligence agencies, concerning the identity of the individual. In addition, the Attorney General may delay the transfer of the firearm by no more than 3 days and file an emergency petition in a court to prohibit the transfer of the firearm of explosive. An emergency petition can be granted only after a hearing, to which the individual looking to acquire the firearm or explosive receives notice and has an opportunity to participate with counsel. Finally, in the case of an emergency petition filed which has been denied, the court shall require that the United States pay the costs and attorney fees of the individual. The bill was introduced in the wake of House Democrats' sit-in calling for action on gun control after the tragic Orlando shooting. It is supported by the National Rifle Association (according to news reports). Several Democrats have expressed opposition and intent to offer amendments. The bill creates the position of Assistant Secretary for Mental Health and Substance Use Disorders and establishes the National Mental Health Policy Laboratory and the Interagency Serious Mental Illness Coordinating Committee. It expands the number and type of mental health services that states may cover under Medicaid; prohibits Medicare and Medicaid from restricting access to drugs used to treat mental health disorders; eliminates the 190-day limit on Medicare coverage of stays in an inpatient psychiatric facility; and expands the Certified Community Behavioral Health Clinics demonstration program. The bill would repeal provisions that disqualify expenses for over-the-counter medicine under health savings accounts (HSAs), Archer medical savings accounts (Archer MSAs), health flexible spending arrangements (FSAs), and health reimbursement arrangements (HRAs). "Sanctuary cities" refer to cities that have policies designed to shelter immigrants who are in the United States illegally. Most of these cities do not allow municipal funds or resources to be used to enforce federal immigration laws, usually by not allowing police or municipal employees to inquire about an individual's immigration status. Read more about "Sanctuary Cities" from POPVOX. The bill increases the maximum prison term for an alien who reenters after being denied admission, excluded, deported, or removed (from two years to five years) and establishes a 5-year mandatory minimum prison term for a person who reenters after being removed following a conviction for an aggravated felony or following 2 or more prior convictions for illegal reentry. Pre-emption: immediately prohibits states or other entities from mandating labels of food or seed that is genetically engineered. National Uniform Standard: the U.S. Department of Agriculture establishes through rulemaking a uniform national disclosure standard for human food that is or may be bioengineered. Disclosure: requires mandatory disclosure with several options, including text on package, a symbol, or a link to a website (QR code or similar technology); small food manufacturers will be allowed to use websites or telephone numbers to satisfy disclosure requirements; very small manufacturers and restaurants are exempted. Meat: foods where meat, poultry, and egg products are the main ingredient are exempted. The legislation prohibits the Secretary of Agriculture from considering any food product derived from an animal to be bioengineered solely because the animal may have eaten bioengineered feed. *A "legislative vehicle" is a bill that is amended with another bill. This one was particularly confusing: S. 764 was originally the National Sea Grant College Program Amendments Act (passed Senate 7/28/2015). The House added the Defund Planned Parenthood Act on 9/18/2015 and sent it back to the Senate.The Senate is now considering the bill with the GMO language, completely stripping out the other provisions. Confused? So were the senators. Extends through December 31, 2019, provisions requiring the President to impose sanctions against individuals in Venezuela who are responsible for human rights violations. This bill increases from $1 million to $5 million the aggregate amount of securities sold to all investors by an issuer that qualify for the crowdfunding exemption. Establishes the United States Semiquincentennial Commission to plan, develop, and coordinate the commemoration of U.S. history leading up to the 250th anniversary of the founding of the United States. Establishes the 400 Years of African-American History Commission to develop and carry out activities throughout the United States to commemorate the 400th anniversary of the arrival of Africans in the English colonies at Point Comfort, Virginia, in 1619. Provides $21.7 billion in funding for programs that will "help boost economic growth and opportunity, to protect consumers and investors, promote an efficient federal court system, and stop financial crime." Authorizes the Department of the Interior, in cooperation with the state of Wyoming, to amend the Definite Plan Report for the Seedskadee Project authorized under the Colorado River Storage Project Act. To exclude striped bass from the anadromous fish doubling requirement in section 3406(b)(1) of the Central Valley Project Improvement Act. Establishes the Clear Creek National Recreation Area in California to promote environmentally responsible off-highway vehicle recreation and support other public recreational uses. Provides for the establishment of a national memorial and national monument to commemorate those killed by the collapse of the Saint Francis Dam on March 12, 1928. Places U.S. Forest Service land in Tuolumne County, California, in trust for the benefit of the Tuolumne Band of Me-Wuk Indians. Places certain Federal lands located in Tulare County, California, into trust for the benefit of the Tule River Indian Tribe.